Practicing orthodontics gives me the chance to make a lasting, positive difference in each patient’s life. Treatment not only leads to a cosmetic improvement of a patient’s teeth and appearance, but often results in an improvement in the person’s self-esteem and confidence. Beyond that, orthodontic treatment also affects a person’s oral and overall health. Properly positioned teeth mean better function and less stress on the jaw joints and face/neck muscles, as well as improved chewing for better digestion. Treatment also means it is easier to brush and floss the teeth, which decreases the likelihood of the patient developing dental or gum disease – provided the person practices good dental hygiene, of course. As an orthodontist, I appreciate the different people I interact with each day. My patients always have something new to tell me: children and teens talk about their classes, extracurricular activities, and weekend plans, and adult patients talk about their professions and experiences. I enjoy our conversations and what I learn from each exchange. This is definitely an added benefit of the profession! That said, I think the best part of being an orthodontist, and therefore the most rewarding, is the day a patient finishes treatment and we take off their braces. The person looks in the mirror and sees all they have accomplished: they have a smile that won’t stop and they can’t wait to show it to the world! Before pursuing orthodontics, I practiced general dentistry for five years. That experience gives me an advanced perspective in treatment planning, as I always think about the person’s future dental health and what I need to do to ensure their smile remains healthy and strong. Continuing education (CE) is core to who I am and how I practice orthodontics. I stay up-to-date on the latest techniques so my patients achieve the best clinical result and have a comfortable and efficient treatment experience. These organizations offer a range of CE opportunities, from lectures and seminars to regular meetings. Through them I am able to learn from leading orthodontic and dental practitioners and researchers. Originally from Erie, PA, my family and I now live in Lutz, FL. 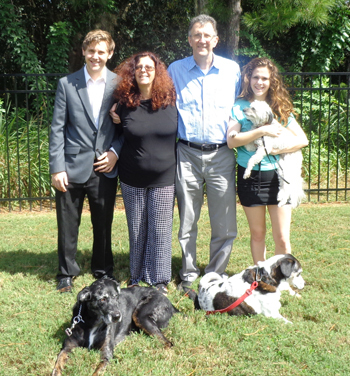 My wife Miriam and I have two children: son Brian and daughter Rachel. We also have three dogs, all rescues or strays, who are part of our family. When I’m not seeing patients, my priority is time with my family. I also enjoy playing tennis, watching movies, and traveling. Our family is very involved with different charities, always with a focus on helping to strengthen and better our community. We support the Humane Society and our children have helped out with non-profit community health clinics. We have also participated in Alzheimer’s fundraisers, YMCA events for children, and a range of fundraisers for projects and organizations in Hernando County.